Although born in Göttingen, Germany, in 1967, Dirk Engelhardt moved to Berlin to study at the University of Berlin and stayed. He worked as a freelance journalist, contributing food, travel, and life-style material to a variety of prestigious publications, before moving to Barcelona, in 2008. While in Spain, Dirk set up Tapas Tours Barcelona, taking visitors on a guided walking food tours through the city. Dirk and his clients so enjoyed the tours, that upon returning to Berlin in 2013, he founded two walking food tours as adjunct to his writing. 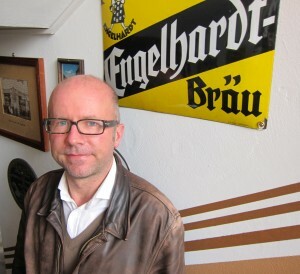 Dirk guides The German Food Tour on Tuesdays, Thursdays and Saturdays evenings taking participants to four privately owned restaurants in Berlin’s nicest neighborhood. Each of the restaurants offers a sample of one of Germany’s regional specialities along with wine and beer. The Berlin Food Tour runs Mondays, Wednesdays and Fridays and includes a market tour, tasting of Berlin specialities in a typical wirtshaus (restaurant, tavern and beer garden), and coffee and cake in a café. Dirk includes no more than 12 participants in each tour, speaking English, German or Spanish—whatever the group desires. In addition to eating and drinking, tour participants gain Dirk’s insider account of German foods and beverages as well as tips as where to find the best restaurants in Berlin. As to the latter, we jumped to the chase and asked Dirk to list his ten favorite places to go in Berlin for different type food experiences. He sent the following. Thank you Dirk. own restaurant. Wooden floor, wooden chairs, wooden bar, wooden tables, and everything has been in place for 113 years. 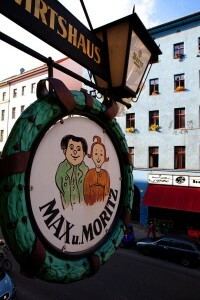 Berlin only has 10 German restaurants that still survived from olden times. Be prepared to receive huge plates that will leave you full to the top. No need for dessert! The biggest meat dish is the Schlachteplatte with everything the butcher just killed (13,5 Euro). brewed by a small brewery in the neighborhood (0,5 Liter = 3,2 Euro). Esszimmer in German means “eating room.” Every house in Germany has an eating room next to the kitchen. This restaurant is situated in an old storage building and the interior is in the old Berlin style with high ceilings and tables covered with white linens. Chef Thorsten Warnke cooks ”refined German,” as he calls it. The menu changes according to the season and features such dishes as carrot-orange soup with ginger and crabs, salmon with fennel and pasta, and the famous Rinderroulade with red cabbage and knödel. 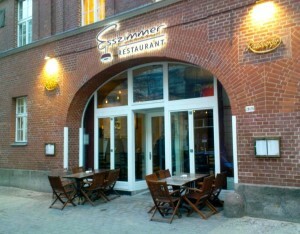 The restaurant gets its fish from the German North Sea and wines from both Germany and France. I go there at least once a month on Sunday morning for the best brunch in town. Not only is the food great, but also the restaurant employs the prettiest (Turkish) waitresses, who are charming to every guest and always smile. The brunch is a mix of Turkish and German specialities, and includes olives, fried mozzarella sticks, salmon and horseradish, fried eggplant, humus, eggs and sausage, lasagne, potato gratin and much more. All you can eat for 10,5 Euro! second house, Mogg & Melzer is the best place to taste Jewish food. 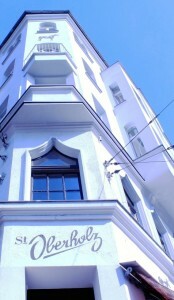 In fact the deli sits in a building which was the home of the Jüdische Mädchenschule (Jewish girls school) in the beginning of the 20 century. Owners, Oskar Melzer and Paul Mogg, both DJs, have travelled the world and bring the best food to their menu. The menu, by the way, is only available in English, to the anger of some German guests, although some dishes, such as Matzo ball soup, shashuka, pastrami sandwiches and cheesecake don’t need translating. In this place you can have your breakfast until 5 p.m. 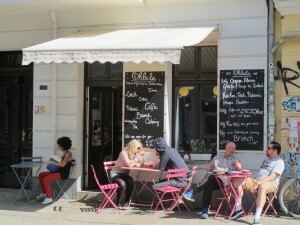 They have a good choice of bagels, focaccias, sandwiches, toast and cake, and good coffee. their office space, and some startups started here. A French couple recently opened this place. It is small, but very personal offering a small number of freshly made dishes. The food is mouth watering, and even meat eaters will like the salads, pastries, soups and quiches. Best gluten-free cakes in the city! On Sunday there is an all you can eat brunch for 13 Euro. 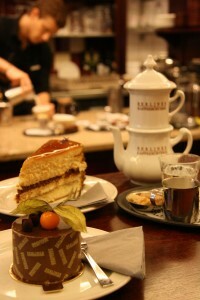 Go only for the smell of coffee and chocolate, and you will be happy. 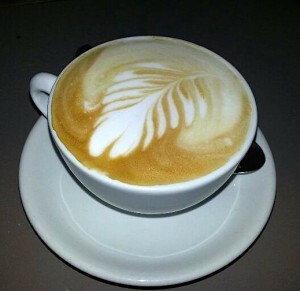 The place offers more than 100 different house-roasted coffees. You even can choose which brewing method you want: french press, hand filtered or with a Kona coffee pot. They also have homemade cakes and an extensive choice of rare chocolates, such as Gianduiotti, Bonnat, Amatller, Blanxart, Zotter and Valrhona. Of course currywurst is THE special dish amongst all Berlin fast food dishes, the big rival of Döner Kebab. The recipe is very simple: take a fried wurst (pork), cut it into pieces, pour a lot of Ketchup over it and add some curry powder. 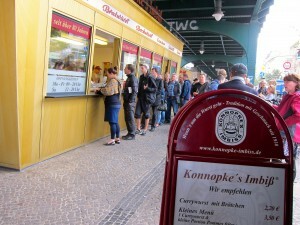 Konnopke claims to have invented the currywurst in the year 1930, and since the place is mentioned in every travel guide about Berlin, it is always crowded. Currywurst also made its way to the expensive West End of Berlin. At a stand on Kurfürstendamm, currywurst is served with a glass of Champagne for less than 10 Euro. With two Michelin stars, Tim Raue is one of the best restaurants in the city. Chef Tim Raue also owns the Sra Bua in the Adlon Hotel and La Soupe Populaire. 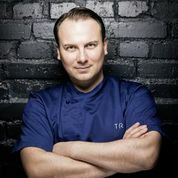 He plans to open a fourth place soon, although he spends most of his time at Tim Raue in Kreuzberg. Every dish he serves is unique in character and aroma. Every guest leaves the place with a smile. Price is high even for Berlin; the Unique Menu is 168 Euro without drinks—and without the Peking duck, which you can add for 24 Euro extra. For a food experience, available only in summer, head to the THAI PARK in Preußenpark in Wilmersdorf, next to U Bahnhof Fehrbelliner Platz, where every Sunday between 10 a.m. and 5 p.m., around 40 Thai people cook really authentic Thai dishes. Among the offerings you will find salad of papaya, grilled skewers of pork with peanut butter sauce, fried spring rolls, and seafood soup. Every Thai lady has her own specialities. They don’t speak much German or English normally, but you can see what you buy. The average price for one dish is 4 or 5 Euro. There is also Thai beer and freshly mixed Thai shakes with fresh fruit. 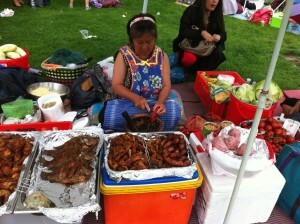 You only have to bring your picnic blanket and a great Sunday afternoon on the green lawn is guaranteed! Read more about Berlin HERE.